Uhluvitsa cave is one of the most beautiful caves in Bulgaria. It is situated at a distance of 3 km north-east from the village of Mogilitsa, at about 30 km southwest from Smolyan and about 37 km from the resort Pamporovo. 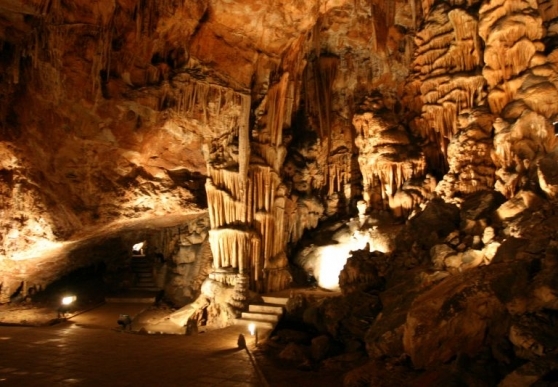 The cave is situated in the locality of Sinite Virove in the Rhodope mountain, near the border with Greece. Uhluvitsa is situated at 1040 m above the sea level, and the temperature inside it during the whole year is 10° – 11° С. Its length is 460 meters, but only 330 meters of them are suitable for visits. The cave is one of the oldest in the region. It was found in 1967. Its name comes from the word Ululitsa – a species of Owl which had probably lived in the region of the cave. With its beautiful formations, Uhluvitsa is often compared to an underground palace. It is decorated with multiple beautiful formations, sculptured by the water and the air currents – dendrites, looking like corals and trees, the rarer helictites which look like small stone suns, the stalactites, the stalagmites and stone falls typical for every cave. The cave is a few levels high. The Hall of the Abysses is situated on the upper floor. The throats of four deep abysses descent from this hall down to the lower floor which can be reached by a steel metal staircase. This gallery is the most beautiful part of the cave. The cave ends with 7 beautiful lakes which fill with water early in the spring. The most attractive formation is the big stone fall which sparkles in white. If you are with an automobile, you can leave it at the parking lot constructed especially for this purpose in the foot of the hill, and then you can walk along the alley and climb the steep slope in order to reach the entrance of the cave. At the parking lot there is a cafeteria and alcoves for resting. One can enter the cave only accompanied by a tour guide.